At Blue Surf Adventures, beautifully located in tropical Santa Teresa, Costa Rica, we offer surf lessons for surfers of all ages and skill levels. We welcome beginners, and can help intermediate surfers hone in on their skills to improve their surf and advance to new levels. 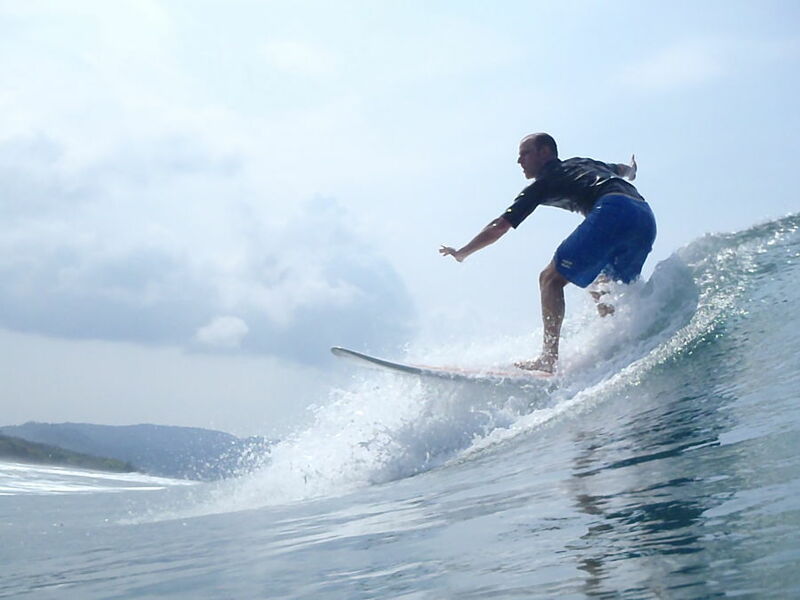 No matter your current level, our Costa Rica surf lessons are an excellent way to advance your surfing skills! While we offer surf packages and surf camps, a lot of people really just want a few surf lessons while they are in town or on vacation in Costa Rica. This is a magical and beautiful place to learn to surf, and an even better place to improve your surfing. Locals of the area, our instructors are extremely experienced, knowledgeable, and passionate about surfing, and can act as local guides for the more experienced surfer. Experts on the area’s surf breaks, our instructors will be sure to take you to a safe location based on the current conditions and your individual skill set. Our experienced surf instructors are CPR certified and make safety their first priority to ensure you have a safe and fun experience. We welcome beginner and intermediate surfers for our Costa Rica surf lessons. If you are new to the sport of surfing, we will educate you on surf etiquette, knowledge of the ocean, pre-surf stretches, paddling out, standing up, and all of the necessary skills so you go home stoked about your ability to surf! We aim to leave you with valuable knowledge so you can safely and confidently continue surfing as a sport and a way of life. If you are already an intermediate surfer, we will help you progress your ability and take you to locations in the area that will be best for you current surfing skills. Our instructors will give you one-on-one attention and guidance based on your skill set and knowledge. Our lessons never exceed a 2 to 1 student to instructor ratio, allowing you to get the attention you need in order to improve your surf. Join us for fun, safe, and educational Costa Rica surf lessons off the beautiful beaches of Santa Teresa and Mal Pais for a memorable experience that will last you a life time! Stay with us at Blue Surf Sanctuary, our boutique hotel and surf school for the complete Costa Rica and Blue Surf experience.